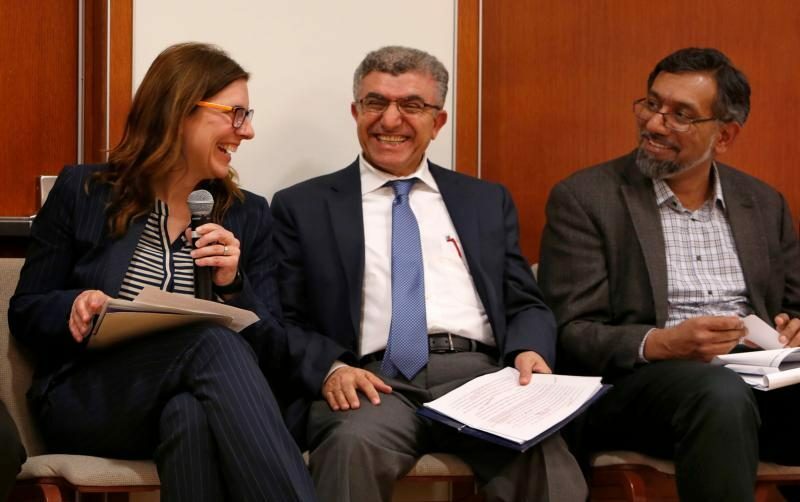 CHICAGO (CNS) — The way to peace runs through seeing one another as brothers and sisters, Catholic and Muslim leaders confirmed March 25 at a session of the National Catholic-Muslim Dialogue held at Catholic Theological Union. Chicago Cardinal Blase J. Cupich joined Sheikh Abdur Rahman Khan at the session. They are the two co-chairs of the national dialogue. Session participants were reflecting on a document on “human fraternity” and improving Christian-Muslim relations, which was signed Feb. 4 by Pope Francis and Sheikh Ahmad el-Tayeb, the grand imam of al-Azhar and a leading religious authority for many Sunni Muslims around the world. They signed the declaration during the pope’s visit to Abu Dhabi, United Arab Emirates. “The publication of this statement on human fraternity testifies to the profound respect and friendship that exists between the Vatican and al-Azhar and it is a sign of the good that is possible between Christians and Muslims and can serve as a corrective to the false narrative that our two faith traditions are completely at odds, are fated to be enemies,” Cardinal Cupich said. Khan, chair of the Shariah Council of the Islamic Circle of North America, recalled being a child growing up in a small village and reading about wars and fighting in the olden days. Khan recalled the killing of 50 people at two mosques in Christchurch, New Zealand, March 15, less than six weeks after the pope and the grand imam signed the document calling for Catholic and Muslims to recognize their kinship. The massacre also followed a litany of attacks on believers of many faiths: those at the Tree of Life Synagogue in Pittsburgh; at Emanuel African Methodist Episcopal Church in downtown Charleston, South Carolina; the Sikh Temple in Oak Creek, Wisconsin, among others; as well as attacks on minority religious groups in India, Myanmar and China. He said the crisis is, at least in part, the fault of political leaders and dictators who seek to divide people and foment hate. People of faith must build bridges with one another and speak up. Cardinal Cupich said there are three steps to building fraternity: establishing and nurturing dialogue, striving for cooperation in daily life, and working toward mutual understanding of one another’s beliefs and practices. God calls all people to dialogue with him, Cardinal Cupich said, and to dialogue with their neighbors, each of whom is made in God’s image. In a time of isolation and polarization, the document signed by the pope and the grand imam offers another option. “What this does is breathes life into our social communion,” said Malik, an associate professor of political science at Xavier University in Cincinnati. Rita George-Tvrtkovic, an associate professor of theology at Benedictine University in Lisle, Illinois, said she was struck by the language of kinship that was used in the document.